According to the legend, when Buddha reached enlightenment he invited all the animals to celebrate their joy. To that invitation came the Buffalo and other 11 animals that were rewarded with the inclusion in the Chinese zodiac. In the Chinese Horoscope, we can be an animal or another depending on the year we were born, but we can be another depending on the month and the time of birth. How do I know if I am a Buffalo? As we have indicated before, each animal ‘governs’ a specific year. 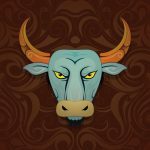 The years of the Buffalo in the Chinese Horoscope are: 1901, 1913, 1925, 1917, 1949, 1961, 1973, 1985, 1997, 2009 and so on, adding 12 years to the previous figure. In the Chinese Horoscope, the Buffalo is characterized by its kindness, patience and care. People born under this sign tend to take their responsibilities very seriously and expect other people to do the same. They enjoy things well done, which makes them lovers of routines and order. Those born under this sign of the Chinese Horoscope are hardworking people with a strong willpower to achieve what their goals. They inspire and give confidence to others so they are usually perfect companions. Sensitivity: people born under the year of the Buffalo like to do well with others, therefore, when other people do not act as expected, they feel attacked. Efficient and disciplined at work. Somewhat distrustful in terms of love relationships, which makes them be defensive at the beginning. Buffalos with the influence of the water element are good counselors. They know how to listen, understand and give their opinion with great honesty. People of this sign that have an influence of the wood element are very adaptable, which leads them to want to experience new things constantly. On the less positive side, they are too temperamental. Highly passionate although a bit unsuspecting in terms of emotions. If they’re in a good mood they’re the greatest companions, but they also can be highly self-destructive, if things don’t go well. On the contrary, Buffalos born under the earth element do not like to take risks which makes them be careful and methodical. They are excellent in business. They’re focused on what they want and on how to work to achieve it.